So today I have the most girly mani I think I have ever worn... There's a lot of pink going on but it is Wednesday after all! I created this design to review the super cute charm on my index finger from Lady Queen Beauty. They are an online store which sell all sorts of nail art supplies, jewellery, hair accesories and makeup at very reasonable prices. They are a fairly new store so I hadn't heard of them before they contacted me. 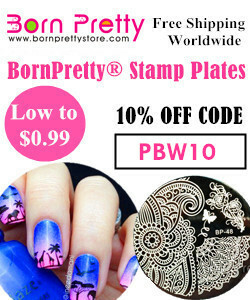 I was able to choose 2 nail art products to review; the first being this adorable charm and the second a stamping plate. They ship internationally via Singapore or Hong Kong airmail and shipping generally takes between 7-20 business days. You'll find out more information on their website HERE. Its a silver bow made up of two heart shapes with pearls in the centre. It measures 10mm by 5mm. You can find the item HERE (item number #NA0656) and this specific charm is number 845. It costs $1.76 approx £1.13 BUT remember you can use my code HYLC15 for 15% off your order! OPI: Kiss me I'm Brazilian (I received this in my July Nailbox) £8.95 from Nailpolishdirect. Charm from Lady Queen Beauty (please see above). I really like this charm; it is very cute and dainty and I think it adds a little elegance to a nail art design. The price is pretty reasonable and the charm appears to be good quality. It is very simple to apply to the nail; simply apply nail glue to the back of the charm and place the charm in the desired position on the nail. There isn't much more I can say about it really but I definitely think I will be buying some more charms like it as it is so pretty! Use my code HYLC15 for 15% off your order! Hope you guys liked this design! Ooooo that charm is adorable =] and that shade of pink is gorgeous!